Give the gift of health with the highly revered Woodcott Spring Desert Blackseed Honey 180g. 100% raw, cold-extracted, unfiltered, pure natural Spring Desert Black Seed Honey are packed with all the powerful nutrients with its many healing effects due to its incredibly high antioxidants, minerals and antibacterial properties. 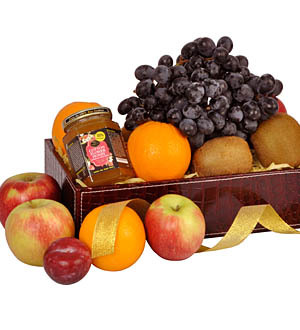 These miracle honey is packed with 4 types of freshly picked fruits, presented in a Seedley leather-like decorative box. As only the freshest fruits are used for all our fruit arrangements, the types of fruits and seasonal flowers may be subjected to change.